Posted in Climate Change and tagged British Council, British Council India, Climate, COP17, Environment, International Climate Champions on December 15, 2011 by anu04. The Conference of the Parties (COP) is the governing body of the Convention, and advances implementation of the Convention through the decisions it takes at its periodic meetings. The Conference of the Parties has been held in 16 countries with Climate Change being an increasingly important issue across the world. The last two conferences in Copenhagen and Cancun respectively have caused quite a stir among the nations resulting in various heated discussions and some successful policy implementations. COP 17 was held at Durban, South Africa this year in the month of November. This place apart from being rich in its bio-diversity is now also looked upon as a country with opportunities for economic development. With on-going climate negotiations all over the world this event is much awaited among environment enthusiasts and policy makers it was an event of huge magnitude and great significance. The negotiating process on climate change revolved around the sessions of the Conference of the Parties to the UNFCCC (COP), which meets every year to review the implementation of the Convention. The COP adopts decisions and resolutions, published in reports of the COP. Successive decisions taken by the COP make up a detailed set of rules for practical and effective implementation of the Convention. There were always moments which demanded absolute attention tracking the policies and changes every country has made or is about to make. Thousands of participants, including government representatives and observer organizations, have attended previous climate change conferences. The sessions in Durban attracted over 20,000 participants, including some thousands of government officials, and over 10,000 representatives of UN bodies and agencies, intergovernmental and non-governmental organizations, and around 4000 accredited members of the media. The UN Climate Change Conference in Cancun last year had over 11,800 participants. Participation in COP 17 and CMP 7 was restricted to duly nominated representatives of Parties, observer States, accredited observer organizations and accredited press/media. Those Parties to the Convention that are not Parties to the Protocol may participate as observers in the meeting of the Parties. All Conferences to date have had a high-level segment attended by anywhere from 70 to 100 ministers and senior officials, usually at the end of the session. The high-level segment normally includes an opening or welcoming event with some head of state participation and is partly attended by the Secretary-General of the United Nations. Arriving during the second week of COP had its own advantages and disadvantages. While I missed the numerous discussions and meetings I made it just in time to attend the launch of ‘Momentum for Change’ providing me the opportunity to carefully listen and gain perspective from the plenary chaired by UN Secretary General Ban Ki Moon, President of South Africa Jacob Zuma and UNFCCC Executive Secretary Christiana Figueres marking the initiative of the United Nations system. This conference as a whole was a great platform to meet leaders and negotiators from all over the world sometimes playing a huge role in the decisions you make. I also had the opportunity to meet and interact with Mrs.Jayanthi Natrajan, Environment minister of India. While many sit back and start to think of this conference as ‘just another conference’ which is over hyped , one might want to come take a look at the magnitude of this event and the support of the youth that spreads around like wildfire keeping the momentum at a progressive pace. Yes, there are many setbacks- but out of this imperfection there lies a level of agreement with thousands of youth wanting their voices heard. Being part of an event of such a huge scale only made me want to go back to my own country and provide them with the vision and knowledge I gathered here and share my experience. Posted in Climate Change and tagged British Council, British Council India, Climate, COP17, Environment, International Climate Champions on December 5, 2011 by anu04. Its been a rare privilege and great learning experience. I have been involved in various activities all over Durban, some have been such a great experience where I met key people. On 25th at the opening session of COY7, I conducted a workshop on “Building Grassroots Groups”. I spoke about my experience with starting up an organization. I was grateful that people really appreciated my talk, and asked me to present the again on the following day (26th) at COY. I presented again to a much bigger and a much diverse audience and went into details using my own experience and some that I had gained from the workshop in Bangalore. I used stories of Climate Champions in India to motivate them to fight for their cause. The event was received with much warmth and appreciation and I was humbled by their kind words. On the 27th, we went on the Climate Train. The much anticipated event saw the Executive Secretary Ms Figueres, Ms June Joseph-Langa, CEO of Indalho Yethu (SA’s main Environmental Agency) and the Mayor of Durban. I interacted with Ms. June and she invited me to hold a workshop for young South African kids aboard the Climate Train!. It was a great honour indeed and I will be conducting them next week. On 28th, I attended the session chaired by Dr, RK Pachauri, Director of TERI. The session focused on “Response of Indian States to Climate Change: Development of State Action Plans against Climate Change. I asked Mr. Pachauri the following question: ”Thank you for the opportunity Sir. My name is Saket, I am the British Council’s Climate C hampion from India. I have been keenly following the development of State Action Plans on Climate Change. How in you’re opinion can young people take part in development and implementation of such policies?” I later managed a photo with him as well!. Climate Champions and the Climate Caravan were hosted for a business leaders dinner on 28th night. I met up with British Council representatives, Mr. Sundru Pillay, the project manager of the Climate Train, Mayor of Durban and several other key partners of the British Council in South Africa. Mr. Pillay (who is also the President of Lions International) invited me to deliver a guest speech at the Annual meeting of Lions Clubs International (South Africa) to be hosted aboard the Climate Train on December 2, 2011. I spent a day on 29th, doing workshops with school children in Durban. Kids had come in from all over Durban. It was very delightful experience seeing how seriously going green is being taken in Durban Nguyet from Veitnam and I conducted a quiz where we divided them into groups name Methane, Carbon Dioxide and Carbon Monoxide and asked them to draw their sources. The other team then had to guess. Following this, was a short quiz designed to raise awareness about the intricacies of Climate Change. We planted a sapling with them as well!. I was invited to a dinner marking the launch of WWF’s book on “Towards a Greener Economy” in association with NedBank on 29th evening. The exclusive event saw a panel discussion chaired by the CEO of WWF, CEO of Nedbank and a prominent ecologist. The session focused on major challenges faced by the world current economy and how we can achieve 100% renewable energy by 2050. Amongst several notable people I met was Mr. John Smith, one of the negotiators with UK delegation and the Director of Climate Change Initiative of the British High Commision of SA. He was keenly interested in my project and encouraged me to continue my endeavor. We discussed about India’s stance and the future of Kyoto Protocol. On 30th, I was invited by the Manager of eThikwini Municipality to be a part of the Climate Change Learning Exchange which had representatives from 13 different countries like Germany, France, China, Ghana, Somalia, Norway, Taiwan etc. And I was also the youngest member there! The event was attended by several government representatives with a panel discussion on “Climate Change Adaptation”. It was perhaps one of the most amazing experiences at COP17. We were doing case studies and then building strategies to solve the key challenges highlighted by the case study. It was such a learning experience solving key problems along with policy makers from around the world. On the sidelines, I met with the Deputy Director of French National Bank, and discussed the future of Carbon Markets. On 1st, I was invited by Ms. June Josephs-Langa, CEO of Indalho-Yethu to attend a breakfast meeting marking the launch South Africa Youth Chapter on Climate Change. The meeting was attended by representatives from various organisations from all across Africa. The afternoon was followed by the Webex session with Christiana Figueres I attended with other champions. I met with the team of official Indian negotiators in their country office as well. In the evening I was invited to attend a Gala dinner hosted by Ms. Maneka Gandhi and the Director of the movie 11th hour. The theme was “Going Vegetarian”. The event was attended by Government negotiating team from India, and several other key people. I was interviewed by the media present there, who wanted me to talk about my work on Climate Change. Executive Director of EmpowermentWorks (an international NGO) was very appreciative of my work, and was very keen on collaborating with my project! Saket is at Durban attending COP17 as part of the British Council delegation. Posted in Climate Change and tagged British Council, British Council India, Climate Change, COP17, International Climate Champions on December 1, 2011 by anu04. After an exciting week of reading up and getting ready for the Climate talks being held in Durban, South Africa. I am finally here to a land where Gandhiji began his initial fight for freedom. It gave me some inspiration about the kind of fight, we youth were participating in – to make this world sustainable. Our work reflects “Satyagraha” – or peaceful protest, analysis, advocacy and that is exactly how we work. We have patiently learnt, engaged, and inspired the masses with the nuances of the issue and policy implication of Climate change and climate talks. Another very important reflection I had was of his principle of Swadeshi – which is reflected in our grassroots actions. Seven champions from around the world – Indian, Greece, Vietnam, Italy and South Africa gave a presentation at the Conference of youth (COY) , which is a preparatory three day youth event leading to the climate change talks under the United Nations Framework Convention on Climate Change (UNFCCC). The climate champions spoke about their respective projects and how to build a grassroot project and integration of our work under the aegis of – British Council. We were a diverse group of people not only in terms of nationality but also in terms of our projects. We conveniently integrated our message under trust, support and unity towards making this world a more beautiful and sustainable. The President of the Conference of Parties hosted a fantastic welcome reception for the attendants of the negotiations. Five of the champions attended the reception which was filled with good food, drinks and welcoming South African music and dance. Quite a grand welcome! We met, Dr. R.K.Pachauri , who congratulated each of the champions on the fantastic work being done back home and that negotiations were just a political excuse and that we champions and grassroots work were the real “champions” of the Climate and people trying to save the climate. The British Council climate booth in the Workshop area is also attracting a lot of people interested in knowing about our work and the message British Council gives. The postcards from around the world, giving a message of sustainability is particularly giving a colorful aura to the booth. The champions also went to schools in Durban and gave various workshops on climate change, ideas for projects and a small preview of policy talks. The children were very excited and wanted to know more about how they could participate in greening the world. Thus the journey of educating and engaging began. Talking of journey, another incredible initiative by the South African government which was supported by British Council in South Africa was the Climate Train which passed the entire length of the country through its rural areas, promoting awareness of climate change and also initiated tree plantation and waste management projects. The champions welcomed the train to the Durban station which was attended by the Mayor of Durban, Executive Secretary of UNFCCC and other dignitaries. It’s been a busy first few days of the Durban talks and journey as climate ambassadors and when people ask about what we do, we say “ Inspire, Engage, Educate” indeed. This is the message from us champions to the people and the UN climate talks! 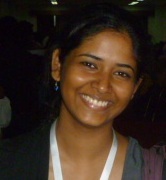 Priti is a young environmental policy and negotiation enthusiast from India with a plethora of experience in climate adaptation in Bangladesh, climate finance, Flexible mechanisms and low carbon transportation modelling. In her spare time she likes to make funny faces in fogged mirrors.